What is this Delicious Bread Batbout? 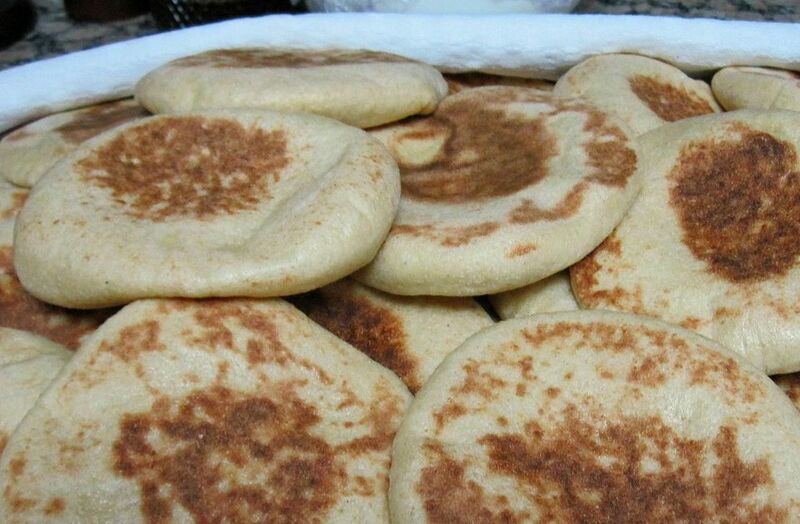 Batbout is a soft, chewy Moroccan bread very similar to pita. Also known as mkhamer, toghrift and matlou', it's cooked on the stove rather than baked in the oven. During cooking, the batbout should puff up as it fills with air, leaving a pocket which can be stuffed with any kind of sandwich filling or spread. The following photo tutorial will show you how to make batbout. Start by making the dough for the batbout. Divide the dough into balls. Keep in mind that the diameter of the cooked batbout will be about 2 1/2 times larger than the diameter of the ball of dough. Place the balls of dough on a lightly floured surface. Cover with a towel, and leave the dough to rest for 10 to 15 minutes. After the dough has rested, take a ball of dough and roll it out into a circle on a lightly floured surface. It should be quite thin – about 1/8 inch thick. Repeat with all the balls of dough. Transfer the rolled out dough to a towel and cover. Leave the batbout to rise until doubled, one hour or longer. When the batbout have risen, preheat a pan or griddle over medium to medium-high heat. Allow ample time for your pan to get hot. Place as many rounds of dough as will fit onto your pan. Allow them to set briefly, then carefully turn them over before they begin to puff up. Continue to cook the batbout, turning several more times, until evenly browned on both sides. During the cooking, you should see the batbout puff up as air heats in the pocket. When the bread is cooked and golden brown, transfer it to a rack to cool. Be very careful while handling hot batbout, as steam trapped inside can escape from a crack and burn you.